Two of the 120 species of the genus Anemone are sold as bulbs, although they are actually corms. Both Anemone blanda and Anemone coronaria are native to the Mediterranean region. Anemona coronaria have been grown as a garden flower in Europe since the sixteenth century. The most popular cultivar is named after the city of Caen, in the Normandy region of France, where they were first cultivated. Today it is often grown commercially for sale to florists. 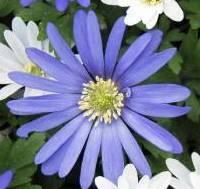 Anemone blanda has also been grown in gardens for several centuries. Many heirloom varieties are still in cultivation today. These spring-blooming bulbs have daisy-like flowers in blue, purple, pink, or white. The foliage is fern-like. The plant grows three to nine inches tall and has a spread of three to six inches. These bulbs bloom for two to three weeks in late spring in zones 7 to 10, where they are winter-hardy. They can be planted in the spring for bloom throughout the summer in colder areas. The poppy-like flowers are red, blue, or white. The plant grows from a basal rosette and the individual flowers have stems of about eighteen inches. Each bulb produces multiple stems. These bulbs are hardy in zones 5 to 9, where they should be planted in fall for spring bloom. They will grow in full sun to shade, and they naturalize easily. They should be kept moist throughout their growing season. They are adaptable to a variety of soil types. Soak the tubers in water for eight to ten hours before planting. Plant two inches apart and about three inches deep. These bulbs are hardy in zones 7 to 10, where they will naturalize easily. They do best in light shade in these warm areas. They should be planted in well-drained, humus-rich soil, and are adaptable to a wide range of pH levels and soil types. Soak the tubers for about twelve hours before planting. Plant two or three inches deep and about eight inches apart. In colder areas, de Caen anemones can be planted in spring after danger of frost is past. They prefer full sun in colder areas. The tubers can be lifted and dried in the fall. These are fast-growing flowers, so a sequence of plantings will result in all-summer bloom. Plant in April for June and July flowering and plant in June for September flowering. These bulbs are great in flower borders or grown in containers. They are an excellent cut flower. De Caen anemones are also a good choice for a butterfly garden. 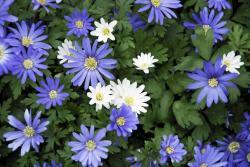 Anemone bulbs are easy to grow. They are not attractive to deer and other pests. Leaf spot and rhizome rot can occur, especially in very wet conditions. 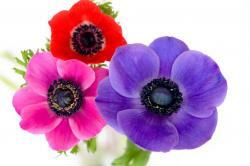 For a Victorian evaluation of these popular flowers, read Poppy Anemone and Windflower.